References to signal rockets in the Civil War era are not uncommon, and I know the British really did employ rockets (perhaps even causing a red glare) ineffectively at Fort McHenry, but I confess I did not know until recently that the state of rocketry in 1860 was such that both sides in the Civil War formed (relatively short-lived) rocket batteries. They were organized like light artillery, but with new-fangled ordnance, and in the case of a N.Y. battalion at least, with tubes on their gun carriages. 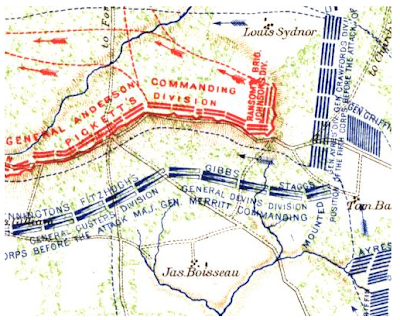 This description is obviously of "Jeb" Stuart's shelling of the Federal encampment on the bank of the James River from Evelington Heights, but only one further reference could be found in either the Union or Confederate reports in confirmation of the use of rockets. Colonel James T. Kirk [he's dead, Jim] 10th Pennsylvania Reserves, also reported that "On Thursday, the 3d instant, while standing in line of battle, I had one man wounded by a missile from a rocket from a rebel battery." [Ibid, 425] One might question the opinion of a volunteer officer this early in the war, but Tidball, a Regular Army officer and a West Point graduate, was too good an officer to summarily dismiss his observations as mere intellectual fulminations. So the search for confirmation went on, and it was found in the remarks of a Confederate eye-witness, Lieut.-Colonel William W. Blackford, then a captain of engineers on the staff of General J.E. B. Stuart, that after shelling the Federal camp for a while with his horse artillery guns. Stuart opened fire with a Congrieve [sic.] rocket battery for the first and last time he ever used this type of field piece. He says it was managed and operated by "some foreign chap" The rockets were described as "huge" with an explosive shell at the end loaded with a liquid combustible nicknamed by the men "liquid damnation." Though Adam and Jamie were able to get a Hale rocket to fly several hundred yards, and a Boxer rocket twice that far (detailed results here), they didn't have much luck reproducing the Great Rebel Missile Attack on Washington. When I first heard the premise for this episode, I thought to myself, busting a myth would be a whole lot more dramatic if it were a myth you'd ever heard of. This missile attack was a new one on me. Surfing the web, I came across this NASA site, which tells the incredible tale, quoting one of Burke Davis' lesser offerings (in the vein of Ripley's Believe it or Not). Make of it what you will. 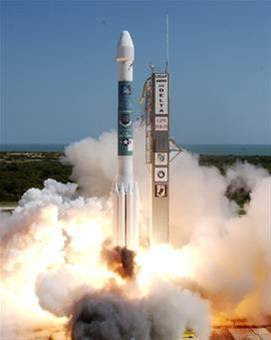 According to the author, Jefferson Davis witnessed the event at which a 12-foot-long, solid-fueled rocket, carrying a 10-pound gunpowder warhead in a brass case engraved with the letters C.S.A., was ignited and seen to roar rapidly up and out of sight. No one ever saw the rocket land. It's interesting to speculate whether, almost 100 years before Sputnik, a satellite marked with the initials of the Confederate States of America might have been launched into orbit. If you're like me, when the O.R. Atlas—after a long stretch out of print—became readily available again about fifteen years ago, you bought two copies: one to thumb through with abandon, and one to keep pristine. After spending $2,500 or so for the 128-volume Official Records, a back-up atlas hardly seemed extravagant. I've noticed that Barnes & Noble, under its own imprint, still offers a cheap edition of the atlas. I haven't looked to see if the bargain rate is a factor of a massive print run, or subpar reproduction. It may be a little of both. I can't recall how long it was after I sent my last payment of a years-long subscription to Broadfoot for the printed O.R. set before the whole thing appeared on a single CD-ROM for about $100, but it wasn't long. In rapid succession, of course, many more essential reference works had been digitized, from Fox's Regimental Losses to Dyer's Compendium (my wife bought me the $125 Morningside edition of the latter for Christmas one year, bless her heart). And while there's nothing finer than kicking back in a comfy chair with a little black volume of the O.R., I have to admit that the convenience of searching and pulling something up online, or off a disk, is irresistible. It's not as if you even have to verify the accuracy of a transcription, since most of the digital versions are straight scans of the original. For years now, I have relied almost exclusively on Cornell's Making of America site to look up citations in the Official Records. But I'll never give up the books. I need to live in a library, and that bookcase full of gold-stamped spines is a member of the family, albeit more dusty than my children. 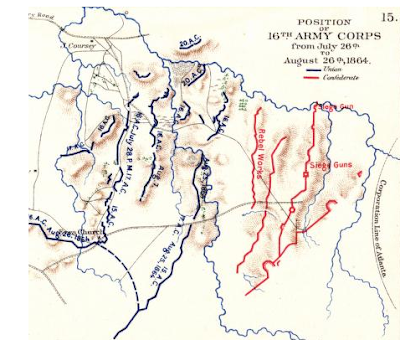 The Atlas to Accompany the Official Records of the Union and Confederate Armies, best known simply as the O.R. Atlas, has long been available on disk, but has also made its way online, thanks to the University of Alabama—see here—(there are some other online venues featuring it as well, such as this one by Simmons Games. It is somewhat harder to use—absent thumbnails—but perfectly usable if you know what plates you're looking for). Kudos to the University of Alabama for making these color plates easily accessible (and thanks to Brian Downey for mentioning it in the comments to another blog). As an added bonus, the site includes links to their Historical Map Archive, Contemporary Maps archives, and even a handy tutorial on the difference between Raster and Vector Imagery. A long-time link at the Soldiers and Sailor's site bears mentioning. If you haven't seen it already, take a moment to view the flags at this online exhibit: Symbols of Battle: Civil War Flags in NPS Collections. It features photos of some of the banners in the collections of nine different National Park Service sites (Appomattox, Ford's Theater, Ft. Pulaski, Ft. Sumter, Gettysburg, Kennesaw, Manassas, Richmond, Stone's River). 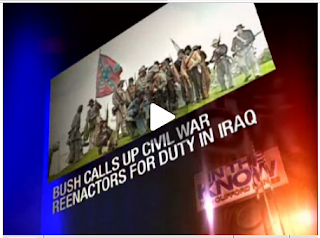 The flag above is at Kennesaw, and interestingly, it is the flip side of a Confederate First National flag. 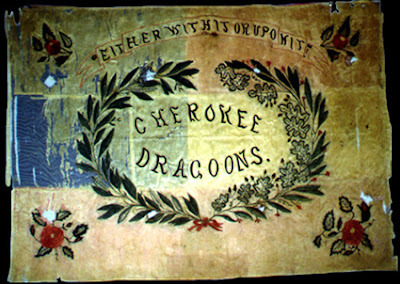 The motto of these Cherokee Dragoons is "Either With it or Upon it," not a phrase in common use today, and not one that lends itself to easy explication. 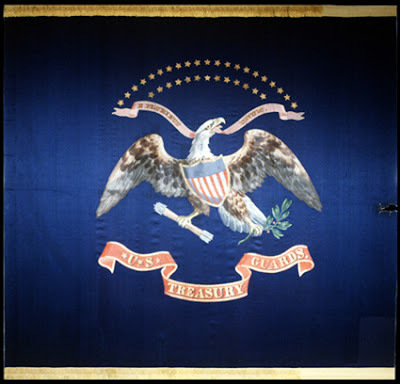 The United States Treasury Guard's flag at bottom is at Ford's Theater. 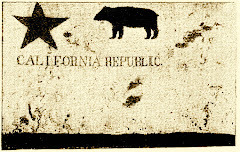 The caption reads: "Dramatically associated with the close of the war, this flag decorated the front of the Presidential box at Ford Theater, in Washington, D.C. on the night of April 14th, 1865. Booth, President Abraham Lincoln's assassin, caught his spur and tore this flag as he jumped from the Presidential Box to the stage below." It was only a matter of time, I suppose. Once the reserves are exhausted, where does the Commander in Chief drum up fresh recruits for overseas deployment? In the brief video above (following a very short ad for Jamaican beer), four pundits discuss the wisdom of calling up America's beefy, wool-clad warriors for duty in Mesopotamia. Does this blog entry have anything to do with the Civil War? Of course it does. Everything has to do with the Civil War. Be patient. 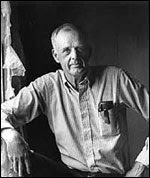 I have long been attuned to the sentiments expressed in much of Wendell Berry’s poetry, essays, and novels. His relentlessly green approach to living, his devotion to conservation and sustainable farming, his eloquent disdain for consumerism – all of this appeals to the part of me that wants to live a rural or remote existence. But he’s effectively a Luddite, and that would never do for me. I love technology too much, even the frivolous kind. Not so with Berry. But that’s not what I wanted to comment on tonight. If I had been anywhere near Chattnooga last weekend, I would have dropped in for some of the AEC 2007 Conference on Southern Literature. “Southern” literature has had a powerful hold on my imagination from early on. People like Faulkner, of course, and Walker Percy, evoke an atmosphere or feeling that you remember for a long time -– and like so many, I’m a big fan of Harper Lee’s book -- but Flannery O’Connor made me want to drop what I was doing and start writing short stories of my own, right now. More recently, as I’ve mentioned elsewhere, authors like T. R. Pearson have refreshed my love of fiction set in the separate world that is the American South. So what do they talk about at the Conference on Southern Literature? Berry, as expected, had some provocative opinions to share. Thanks to Kevin Trumpeter of The Pulse, Chattanooga’s Weekly Alternative, for some summary reporting on the subject.